Here is my handle here is my spout. Since I wrote this piece I get so many people visiting because they are looking for teapot images. I’m not sure if they stop and read or are just checking out the picture but I thought I would share with them the only commercial type teapot I’ve come across that doesn’t leak. If the photo isn’t much good, it’s because I took it myself and I haven’t quite got the hang of things yet. My friend and I were sharing breakfast at a swank restaurant this morning. It was in an area I generally avoid because I find everything about it intimidating. There are family mansions that could house an army, shop fronts I can only afford to look at with my nose pressed against the window and snooty dogs being walked by their snooty owners who seem to know that I don’t belong there. I was sitting in a place where, if we’re judging by their haughty attitudes it must belong to the waiters. Now that I have set the scene for you, you’ll agree it would be a safe place to order a pot of tea, leaf tea if I can get it, but I’ve given up hoping, mostly it’s the same tea bags wherever you go but if you expected a grander tea pot to arrive I’m here to tell you that you would be wrong. 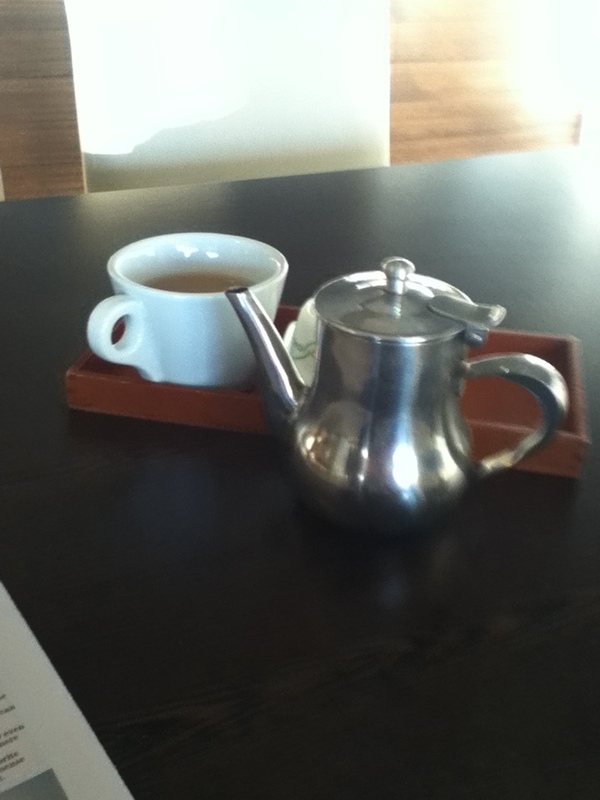 Our superior waiter set a metal tea pot on the table that was the same leaky model that comes from the same warehouse that I would bull doze it if I only I knew where it was. I’m beginning to have a bit of an inferiority complex about those pots. Everywhere I go there they are; perched on the table like malign little trouble makers that they are, daring me to try them without disgracing myself. Without exception, they leak tea on the table and leak tea on my lap. I am forced to call those waiters over and get them to clean me up. Sometimes the teapots are shiny and new with flat lids; sometimes they are tarnished and warped. They’ve been following me around for decades. And every blessed one of them leaks. The queen herself couldn’t pour a dripless serve into a cup using those pots, not even if you paid her. Not that the queen needs the money she’s so rolling in it and not that she ever pours her own. I’m just making a point. I’ve been wondering recently that perhaps nobody is selling those things, it’s possible that they are able to reproduce themselves. I can’t otherwise understand why restaurants and greasy spoons alike have a penchant for them. This morning, when the waitress served up that metal monstrosity I thought I recognised it as one I’d used at a Greasy Spoon place in Fitzroy Street St Kilda in 1982. I almost fainted. I’m going to give up ordering pots of tea in restaurants and save myself for my old Wedgewood china pot that my sister gave me for my birthday. A pot of coffee will have to do when I’m out. For some reason coffee pots don’t want to leak all over me. There seems to be a bit of a theme happening., You and your toilets, me and my tea pots. Is there some sort of deep and significant meaning to it all, do you think? Unfortunately the tea culture has a long way to go to catch up with the coffee culture……but there are a few honest, good quality places that treat customers and tea with respect! Try Richmond Hill Cafe & Larder. Okay S, but it’s interesting you say that seeing that it would have been Tea and crumpets before cappuchino. I remember when coffee was 10 cents a cup because it was water and instant. Of course now they put a teabag in a teapot and charge you leaf tea prices. I like the sound of that place. That’s the problem, S, if you can’t get a decent china pot in a swank restaurant, where can you get it? It’s a lot more special now on a Sunday morning at home, leaf tea and Wedgewood, toast and jam. Mm.